Urban Grill 6 inch Round Aluminum Grill Discounts Apply ! 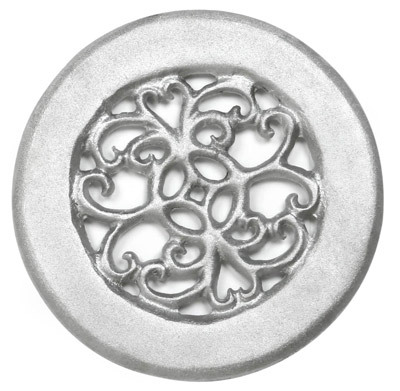 These beautiful round vent covers are a wonderful alternative to plain covers. These decorative air return covers ship unpainted to fit your needs. If you would like to paint your round vent cover to match your furnishings simply coat with primer and then a layer of high quality paint. Please be aware that painted round vent covers are non-returnable. The decorative air return covers are made of durable solid cast aluminum and have a hand crafted non-machined design to match any room. These round vent covers are so versatile; they are rust proof so they will even work for your high moisture room or outdoor needs. The decorative air return covers are made with a recessed back for stress free installation. This approximate 1/4" recessed lip on back also allows for a flatter installation of your round vent covers. These decorative air return covers are also available with or without screw holes depending on your needs. If you are using for wall use, screw holes are required for secure mounting. Screw holes may be preferred for floor mounting if round vent covers are being used over thick carpeting, or if there are children that may pull up the grille. - Remove your existing register or grille. To ensure you order the correctly sized register, measure the actual opening in the wall, floor or ceiling. For instance, this aluminum grille is intended for installation into a 6" round hole. - The inner dimensions of the grille will be slightly smaller than the total faceplate dimensions, so that the grille's frame fits into the recessed opening. This will ensure the flange will fit flush on the finished surface and will completely cover the rough opening. This outer flange will house the various screw holes (if screw holes are requested) to securely attach the grille. - Total outside dimensions of this round return air vent are 7 7/8" diameter. - The faceplate is approximately 1/4" thick and the lip that drops in will vary.